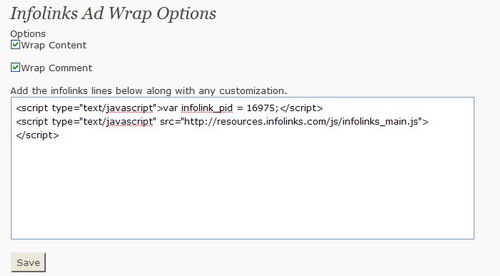 DOWNLOAD Infolinks Ad Wrap @Wordpress. In order to change various colors and customize the Ads, you can put the following lines in the text/code section of the plugin as shown in the above screenshot. To Use more advance features please look below for details. The following parameters enable you to control the color scheme of the Infolinks in-text ads on each page of your website, as well as the content in their resulting ad bubbles. Colors are represented by RGB Hex codes. For example, to represent the color Red you would use ‘FF0000′, making sure the value is surrounded by apostrophes. Visit Wikipedia for more information on mapping colors to their equivalent RGB Hex codes. The infolink_ad_text_color var defines the color of the main text in the Infolinks in-text ad bubble. The default value is set to: infolink_text_color = ’000000′. The infolink_cat var enables the publisher to specify a category that best describes the content of their website. While this parameter is optional, specifying the proper content category can significantly improve the relevancy of the Infolinks in-text ads on the webpage. The <!—INFOLINKS_ON—> and <!—INFOLINKS_OFF—> placement tags enable the publisher to control which areas of the web page will display Infolinks in-text ads and which areas will not. Inserting an “On” comment tells the Infolinks algorithm to search that section of HTML normally for ad phrases. Inserting an “Off” comment tells the Infolinks algorithm to skip forward through the HTML to the next “On” comment or to the end of the code – whichever comes first. Please feel free to comment or suggest ideas! Thanks for the info, but the link color does not seem to be working. Does it take some time before it changes. I have already account approve by infolinks. But after I would activated, it can’t work. What happen with my site? its possible for my wp blog. Thank for infolinks plugin. Am I going daft? How do I set a particular post to carry / not carry infolinks ads (individual post control)? The <!—INFOLINKS_ON—> and <!—INFOLINKS_OFF—> placement tags enable the publisher to control which areas of the web page will display Infolinks in-text ads and which areas will not. I tried your plugin, but it return with error when I put infolinks code on it, “While trying to retrieve the URL: http://www.quantminds.com/wp-admin/options-general.php? That error is not related to the plugin. It’s an Internet connection issue. I have just joined infolinks and installed the plugin and put in the code given but nothing seems to have happened. Nothing showing under edit posts for controlling infolinks and no infolinks showing on any posts. I am using 2.9.1 wordpress? There should not be any option under edit posts. All options are controlled using various codes provided by infolinks that you put in the “Infolinks Ad Wrap” section in the Settings pane. Great plugin! But when I include the category fails on my webpage .. what could be happening? Thanks for this…was having a miserable time trying to manually insert the code in the footer.php file. Don’t know why, but it just would not work. I’m just curious as to whether or not this version of the plug-in will work with WordPress 2.8? At the moment, I can’t seem to get either the plug-in working or manual injection. InfoLinks does not want to work. Any ideas? Yes, it works fine with WP 2.8+. Never mind my previous comment, I just figured it out. I was using lower case not realizing that is case sensitive. Thanks for the plug-in. How can I turn off the ads from my home page and header? I tried adding the to start of my header.php and in single-post.php. However, I still get the ads in my header and main page. Does it work with WP 2.8? Thanks for the plugin. Working great for me! Thanks once again! its possible for wp 2.5? Not tested with WP 2.5 but it should work. Can u try this following version and let me know whether this fixes ur issue or not? I used Kontera plugin to run kontera ads. Now as I registered for Infolinks also. I was searching for such plugin to use & integrate Infolinks ads on my another site. 4. put the scripts you got in (2) and put it in the plugin’s option. What version of WordPress are you using? and what is your PHP version? I suspect it’s “magic quotes”, which is a feature of PHP which automatically escapes content with a backslash is causing that problem. Older wordpress version has this feature turned on and could be the cause of this problem. We have wordpress 2.7.1 installed with PHP 5 …. please guide. Thanks much! .. yes that seems to work. 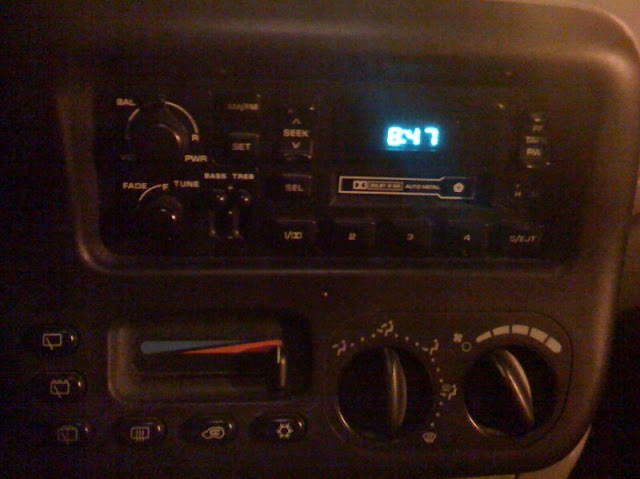 This entry was posted on Friday, March 13th, 2009 at 4:06 pmand is filed under Apps, Plugin. You can follow any responses to this entry through the RSS 2.0 feed. You can leave a response, or trackback from your own site.